Ruby, like Sapphire, is a variety of the mineral, corundum. Most Rubies are mined in Thailand, Burma, Sri Lanka and Africa. All locations produce gemstones of varying sizes, qualities and colors of red. Most gemstones, including diamond, need enhancement through cutting or treatment to be enjoyed in jewelry. Since antiquity, most Ruby has been heated to permanently intensify its dazzling shades of red. This process may leave traces of the material used for heating in the natural inclusions of Ruby. 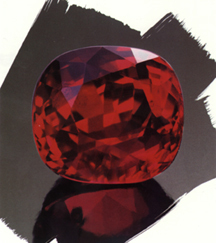 Ruby is one of the most durable of all gemstones. To ensure long-lasting enjoyment of your Ruby jewelry protect it from hard blows and scratches. While today we are not limited by tradition, Ruby is treasured as a gift for July birthdays and celebration of the fortieth anniversary. Ruby has long been regarded as an amulet for passion, protection and healing.